One of the greatest attractions in Florida, aside from its sandy beaches and beautiful weather, are the alligators. People flock from all over the world to the beautiful buoys of the Sunshine State to take airboat tours in the hopes of catching a glimpse of at least one prehistoric monster. While the tours are generally fun and carefree, there have been a few instances in which the tour has gone horribly wrong. From speeding airboats colliding into one another to people actually being attacked by gators, airboat rides have been known to end in disaster, and visitors want to know: who is liable when they do? At Spencer Morgan Law, our Miami boating accident attorneys understand the laws of the land and the sea, and we are especially familiar with Florida law. Though it can be difficult to recover compensation in an airboat accident (passengers may be asked to sign waivers when they purchase tickets), it is not impossible. If you were injured in an airboat accident and if you want to know more about your legal rights, reach out to our legal team today. Airboat accidents do not happen often, but they do happen more frequently than many people would assume. Just last May a person was on an airboat tour when the operator detoured from the usual route due to another vessel blocking the path. When he returned to the path, the operator stopped suddenly, sending everyone aboard flying off. The victim got pinned beneath the engine’s cage, and died later in the hospital from her injuries. In an October airboat accident, 14 passengers were injured, one of which had to be airlifted to a hospital. Two others were in critical condition and three were in serious condition. In total, nine of the boat’s 15 passengers went to the hospital, while the remaining five injured passengers refused medical attention. According to the Miami New Times, over 75 airboat accidents have occurred in the last three years. During that time frame, at least seven people have died and another 102 have been injured. Are Accidents Due to Lack of Regulations? Despite the fact that most U.S. industries are heavily regulated, the laws that make up the airboat industry are surprisingly lax. Though the boats glide at high speeds through the narrow passageways of the Florida Everglades, there are virtually zero safety requirements. Passengers aren’t required to wear seatbelts or life vests, airboat pilots are rarely asked to take boating safety classes, and there is not even a minimum age requirement to operate a vessel. According to the New Times, 64 percent of court accident records assigned fault to the driver, citing negligent behavior as the cause. 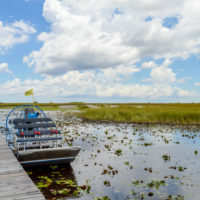 Many airboat operators were found liable due to failure to adhere to navigation rules, alcohol use, careless and reckless driving, and improper lookout. If you or a loved one was injured in a Florida airboat accident, and if that accident was the result of operator negligence, you may be entitled to compensation. A Miami maritime and boat accident attorney can help evaluate the circumstances of the accident, determine cause, and prove liability. To get started on your claim today, reach out to Spencer Morgan Law via phone or online to schedule your free consultation.